We’ve been featured on Joburg.co.za. Text & Images by Cleopatra Shava. Nestled in the quiet area of Craighall Park, AJ’s In The Park restaurant is not only family friendly, but also caters to sporting fanatics with a big screen television to enjoy big games on. The restaurant also offers kids’ events so if you’re planning to throw a birthday party or a young get-together for the kids, AJ’s Restaurant is definitely the place to go. With their children’s play area secured, you don’t have to worry about safety. 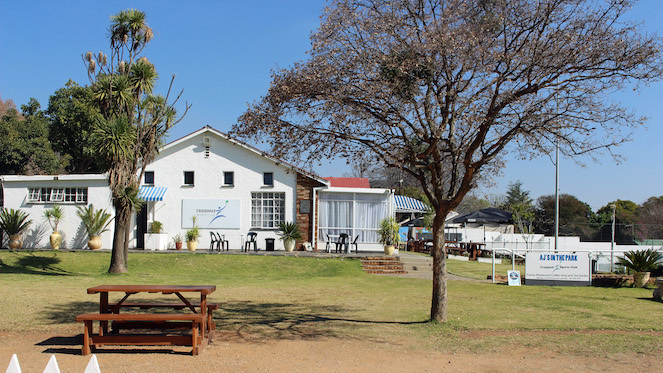 The best part is, the restaurant is located on the same premises as the Craighall Sports Club that has an outdoor field, so it’s fun in the sun for everyone! The restaurant menu covers all major foods you’d expect at such an accommodating venue. From burgers that have made many go back repeatedly to pizzas that will have your mouthwatering at first sight. I was invited to try out some of the menu options and the No. 1 Burger was recommended for being the most popular and super tasty. Now if you can imagine a burger with bacon, feta cheese and avocado… don’t your tastebuds just start jumping? The burger came with a side of chips, but you could opt for a side salad instead. The meal was highly satisfying and other customers that tried the burgers options had nothing but praise and compliments to the chef to give. Aside from the burgers, the restaurant is also popular for their Chicken Schnitzel. Picture a succulent 300g free range crumbed chicken fillet created to please your tastebuds… how delicious does that sound? Oh and what would the world be without pizza? After trying the California and AJ’s wood fried pizza, the Joburg team was full of happiness and laughs. It’s amazing what some good ol’ Italian wood fired pizza can do to cheer the whole team up. The favourite was the California because bacon, feta cheese, and avocado are always a killer combo! Other meals you can look forward to are their steaks, salads, kids’ meals and platters – there’s really something for everyone. For drinks, the restaurant has a fully stacked bar but for non-drinkers and kids, they have yummy milkshakes, fizzy drinks, and spectacular hot beverages. I tried the Hot Chocolate which was absolutely amazing! It’s not many places that can get an impeccable hot chocolate like that. A definite must-try on the beverage menu.